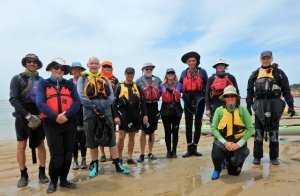 Expedition Kayaks are a fully accredited National Training Provider registered with Australian Canoeing, delivering training programs in the sea & flat water categories. We have full council & Waterways approval to conduct training & coaching on the waterways of Botany Bay, and have been heavily subscribed since launching this new arm of our business in 2014. We specialise in one-one one, pairs & small groups of four or less, committed to the idea that concentrated coaching and mentoring will have a faster and more effective result for our students than big production instruction days. This is a three-hour class for new paddlers or those who would like to review the basics. The focus of our surf ski coaching is maximising your enjoyment of your ski. Our aim is to broaden the number of days you can take your ski out for a paddle, to build confidence in moving water. This is a three hour class for ski paddlers who are comfortable in flat water and want to progress to areas with more exposure and a little wave action. Mark and Rob have decades of local knowledge to ensure conditions to match your abilities. This session will provide challenges in a safe and positive learning environment. Supported practice at all quarters to the wind. The focus of our surf ski coaching is maximising your enjoyment of your ski. Our aim is to broaden the number of days you can take your ski out for a paddle, to build confidence in moving water. remounts and rescues in waves.